Enjoy our home away from home on the quiet side of paradise. Let this be your base to visit Florida's most famous theme park attractions (2 hours to Busch Gardens, Tampa and Walt Disney, Orlando). Come home to your private pool and hot tub to relax after a day of fishing the waters of Charlotte Harbor. Shopping day trip to Naples or Boca Grande or stroll the streets of St Armand Square in Sarasota, all within 1 hour drive. A day at the beach is only 40 minutes in any direction. This home is central to all that makes Florida so special, but a world away from the crowds and congestion. Come to relax for a week or a season. The unique 2-master set-up will accomodate larger groups comfortably. With one master on the main level and the 2nd master upstairs, privacy abounds. The 3 guest rooms are on a separate wing from the main level master. Whether an extended family reunion or simply a romantic get-away, wonderful memories await you at our Florida paradise escape. We are a busy family of seven, with our oldest son off to college. We enjoy travel and try to visit Punta Gorda for a week or two each year. This home comfortably accomodates all of us. This was our family home for several years before work moved us out of the state. We so enjoyed the home and community that we look forward to annual visits to the area. We know that you will, also! Early morning walks, sunsets at Ponce De Leon park, cruising the Peace River, day trips to the beach, lunch pool-side...these are a few of our favorite things. 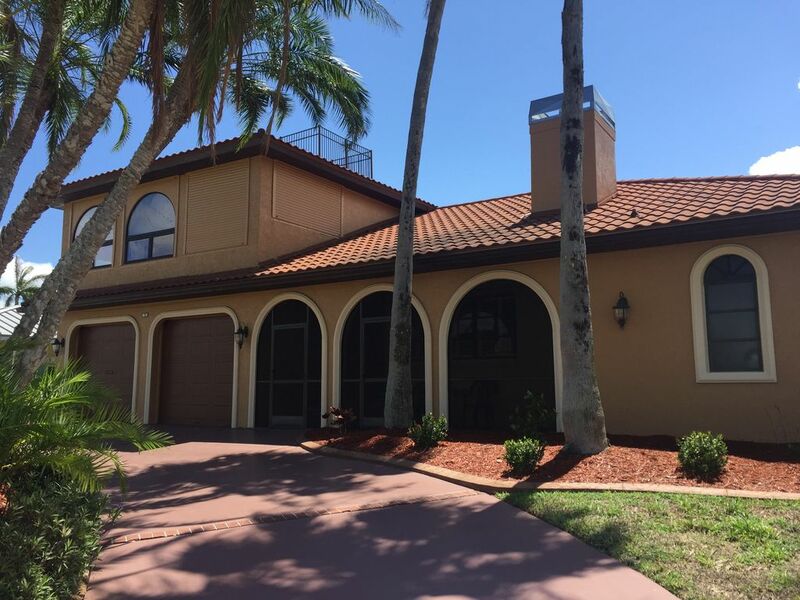 This home sits in prime location on a sailboat canal with views right out to Charlotte Harbor -- amazing sunsets! Fabulous roof-top views from this widows walk. On Sailboat Canal, Great Fishing Off Private Dock, Two Minutes to Open Harbor. Amazing Sunset View from Rooftop Widow's Walk. This is a great location, we had an amazing time while celebrating & enjoying a small family reunion. We highly recommend it! The property owners are very accommodating and flexible to make your stay a wonderful experience. So glad your family enjoyed your Florida family reunion! We hope you come back again soon. We had great time, house was clean, pool was awesome, and home owner was excellent to work with, we will be back!! I’m so glad you and your family had a nice visit! Please come back! We had a great time visiting family and relaxing!! Pool and hot tub where awesome! House was extremely clean and was better than the pictures!!! So happy your family enjoyed their time! Please come back soon! Great for a family of eleven to stay. Didn't feel crowded at all. 4 twin beds, 2 double beds, 1 queen, and 1 king. Also a pull out couch. Neighborhood was quiet, close to the grocery store and restaurants on the water. We were able to fish and watch dolphins out in the canal. This home is very spacious and was the perfect accommodation to house our family members who were in town to celebrate my mother's 95th birthday. There are enough beds to sleep 12 plus a pull out sofa. The kitchen table seats 10 with additional seating for 6 at the outdoor table and seating for 2 more at the breakfast bar. The home is clean and the best equipped of any rental I've stayed in - plenty of dishes, glasses, pots, kitchen equipment, a room full of toys and games, a large gas grill, bikes and a ping pong table. The pool is large and heated with a great hot tub. We would definitely stay here again. Three couples from high school got together for the first time in 50 years! It was great fun, relaxing, and the perfect location. We enjoyed the pool and reminisced about old times. The house was perfect for us - we each had our own bath and areas. The sunsets were beautiful and location close to everything.